"We don't pick and choose what to be afraid of. Our fears pick us." Tash Carmody has been traumatised since childhood, when she witnessed her gruesome imaginary friend Sparrow lure young Mallory Fisher away from a carnival. At the time nobody believed Tash, and she has since come to accept that Sparrow wasn't real. Now fifteen and mute, Mallory's never spoken about the week she went missing. As disturbing memories resurface, Tash starts to see Sparrow again. And she realizes Mallory is the key to unlocking the truth about a dark secret connecting them. Does Sparrow exist after all? Or is Tash more dangerous to others than she thinks? I’m not the BIGGEST fan of thrillers. I mean, I like them ENOUGH but they’re not necessarily the first genre I would pick off the shelf to buy in a bookstore, if you know what I mean. I guess I’m just either really good at predicting thriller novels, or they somehow manage to not be the ‘most shocking book of the year’ they promise to be, and I’m left disappointed either way. Once in a while, however, this rare thriller novel comes along that BLOWS MY MIND. 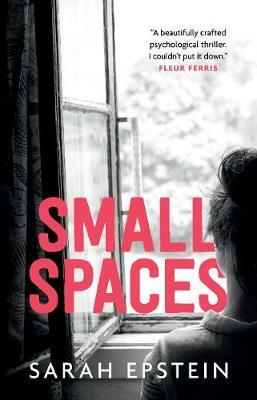 The last thriller I loved was I Let You Go by Claire Makintosh, which I read all the way back in May (which is saying something) and then I picked up Small Spaces, Sarah Epstein’s debut novel. MY THOUGHTS: - HOLY WOW YOU GUYS. I don’t think I’ve EVER been this addicted to a thriller novel before. It felt real, and the fear and the WHAT IS GOING ON element was beautifully created. The plot was very intriguing, but not superfluous and most of all, the characters were all well developed. - I really liked the main character, Natasha. I loved her determination to prove herself and make her way out of home. I LOVED her relationship with her baby brother – it was the most adorable thing ever. She was brave and I truly appreciated her willing to go back and keep facing her fears. - I like the way the story was told in Small Spaces. With a ‘Then’ and ‘Now’ format, through Natasha’s narration, news clippings and interviews with her psychiatrist over the years, as she grew up. It all made the questions of ‘What really happened to Mallory Fisher?’ and ‘What had happened to Natasha all those summers ago?’ so much more interesting. - The one thing I couldn’t like about this book was Natasha’s mother. She REALLY ANNOYED me to no extent in never believing, trusting or even being kind to her daughter. She actually told her “I can’t keep putting up with your lies. I’m tired” without ever having giving her the benefit of the doubt. - I quite liked Morgan Fisher, Mallory’s brother. He was cute and trustworthy, and I would ABSOLUTELY LOVE TO READ ANOTHER BOOK WITH BOTH TASH AND MORGAN. - Once again, and I HAVE to mention this, but the INTRIGUE and the actual THRILL of the book was so well done. Would I recommend this book? HECK YES. Even if you’re not a fan of thriller books like me, Small Spaces was a GREAT read in the genre. PICK IT UP! 4 stars.